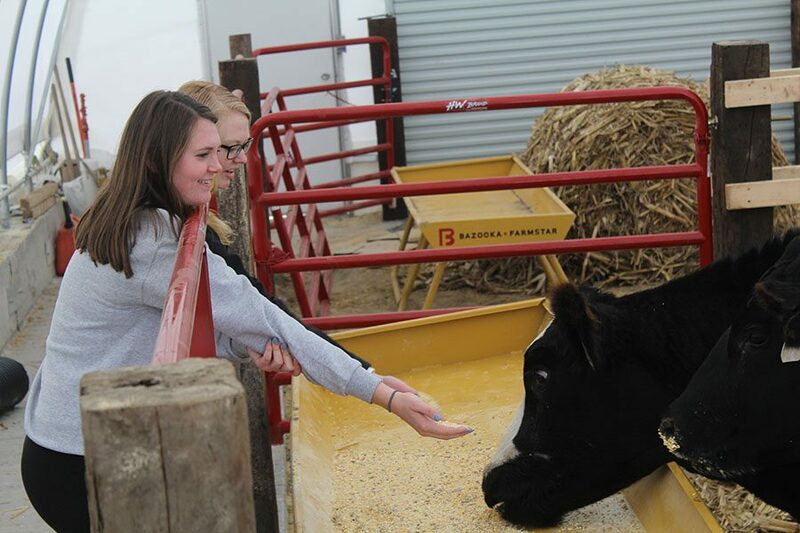 Tehya Demmer (12) and Lauren Ryan (12) watch as one of the cows in the hoop barn eats its feed. What started as simply organizing the Ag room sprouted into something a lot larger. Five Delaware County STEM BEST students, Tehya Demmer (12), Maggie McGrane (12), Spencer Kluesner (12), Lauren Ryan (12), and Parker Kluesner (11), discovered a broken fodder system while cleaning the back room. A fodder system can grow vegetation all year round. The system waters plants once a day and doesn’t use any soil. The seeds sit in the narrow tray and soak for about seven to nine days until fully grown. The students took interest in this system right away. With the two new cows inhabiting the hoop barn located by the bus barn, using the fodder system is a cheaper alternative than having to buy feed for the cows. The fodder system grass is highly nutritious, making a great source of energy for the cattle. Every day during fourth hour, the five students plant more seeds to grow into grass for the cows to eat. After the grass is fully grown it is transferred to the hoop barn where the students feed it to the cows.